Tags: Antique Print, Asia, Bantam, Indonesia, Ship, Vessel. Antique print of Sailing Vessels at Bantam titled ‘Folgen hernacher viererlen Schiff/ deren fich die zu Bantam gebrauchen’. 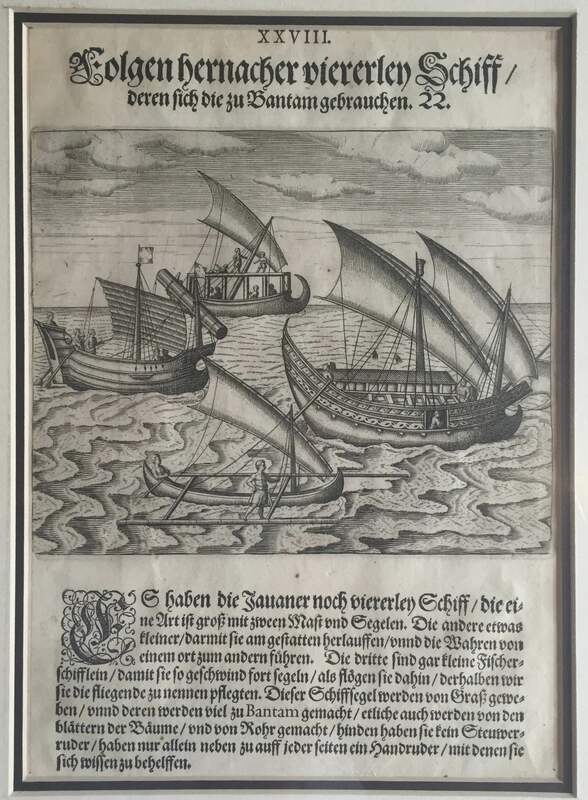 A rare early 17th century black and white print showing various kinds of sailing vessels used in Bantam by the German engraver and bookseller Theodore De Bry who, in 1598, published the Peregrinationum in Indiam Oriental et Indiam Occidentales, a book of early 16th century voyages and travels. There are two distinct series: the first, the Grand Voyages, published in 1590 covering North and South America, and so-called because its pages are taller and wider than the second, which is called the Petits Voyages – published in 1598 and covering the travels in the East Indies and arctic regions. This print is probably derived from the 1599 German edition of the Petits Voyages. Very good overall condition, measures 245 x 175 mm.